The phenomenon of resonance is said to occur whenever for a molecule we can write two or more Lewis structure which differ in the position of electrons but not in the relative position of atoms. The various Lewis structure, none of which is capable of describing all the known properties of the compound are called canonical or resonance structures. The actual structure of the molecule is not represented by any of the resonance structures but is a resonance hybrid of all these Lewis structure. Any of these Kekule structure , cannot explain all the properties of benzene.According to these structure, a molecule of benzene should have three carbon-carbon single bonds of 1.54 A° length and three carbon-carbon double bonds of 1.34 A° length.But actually it has been found that all the six carbon-carbon bonds in benzene are equal. Any two adjacent carbon atoms in benzene are neither joined by a pure single bond nor by a pure double bond.As a result , all the carbon-carbon bond lengths are equal i.e. 1.39 A° and lie in between carbon-carbon bond length of 1.34 A° and carbon-carbon single bond length of 1.54 A°. The circle inside the ring denotes completely delocalized six π-electrons. Due to contribution of structure , the carbon-oxygen bond in CO2 has some triple bond character. A resonance hybrid is always more stable than any of its canonical structure.This stability is due to delocalization of electrons and is measured in terms of resonance energy or delocalization energy. It is defined as the difference in internal energy of the resonance hybrid and the most stable canonical structure. More the number of equivalent resonance structures, greater is the delocalization of electrons, higher is the resonance energy and hence more stable is the compound. The various resonance structure should differ only in the position of electrons and not in the position of atoms or nuclei. All the resonance structures should have the same number of unpaired electrons. In case of atoms of the second period in the periodic table , such resonance structure which violate octet rule should not be considered. As far as possible, all the resonance structure should have nearly the same energy. The more the number of resonance structures, more stable is the resonance hybrid. Structures which are indistinguishable are of equal energy and hence contribute equally towards the resonance hybrid. 2) Structure with greater number of covalent bonds contribute more towards the resonance hybrid. Structure 2 with two π- bonds is more stable than structure 1 and 3 which contain one π- bond each.Hence structure 2 makes more contribution towards resonance hybrid than structure 1and 3. 3) Structures which involve separation of positive and negative charges are of higher energy and hence contribute little towards the resonance hybrid. 4) Lesser the charge separation of positive and negative charges, more stable is the resonance structure. 5) When atoms of different electronegativities are involved , the structure with a negative charge on the more electronegative atom and positive charge on less electronegative atom is of lower energy and hence contribute more towards the resonance hybrid than the alternate structure in which the charges are reversed. 6) Structure having like charges on adjacent atoms are highly unstable and hence contribute little towards the resonance hybrid. 7) Structures which help to delocalize the positive charge make important contribution towards the resonance hybrid regardless of the fact whether the positive charge is on less or more electroneagtive atom. 8) Resonance structure in which all the atoms have octet of electrons make larger contribution towards the resonance hybrid the resonance hybrid than those structures in which one or more of the atoms do not have octet of electrons. In conjugated systems , the electrons can flow from one part of the system to the other due to resonance.This flow of electrons from one part of the conjugated system to the other creating centres of low and high electron density due to the phenomenon of resonance is called resonance effect (R-effect) or mesomeric effect (M-effect)..It is also n-π or π-π conjugation. Groups which denote electrons to the double bond or to a conjugated or aromatic system are said to have +R or +M effect. 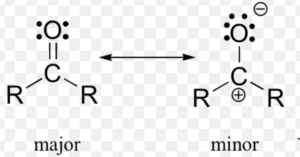 2 Groups which withdraw electrons from the double bond or from conjugated system towards themselves due to resonance are said to have -R or -M effect.